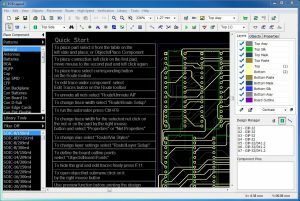 We’re excited to announce an update to our popular, free PCB Layout and Schematic Capture software with the availability of PCB Creator version 3. Here’s a quick Q&A that includes more details on this new release. Q: How has PCB Creator been updated? A: There are a bunch of new updates we’re really excited about, but two of the most significant are: 1. Support for High-speed Differential Pair Routing, and 2. Mac OS X Compatibility. These have been 2 of our most commonly requested features and really allow PCB Creator to appeal to a wider audience of professional and other design engineers. Learn more about new features here. Q: What are the design limitations of PCB Creator? A: PCB Creator allows you to design up to a 4 layer board with less than 1000 pins. But, if you need more capability than this, there is an upgrade path available here which unlocks additional capabilities. Q: Are there any other limitations of PCB Creator? A: PCB Creator does not allow for the export to Gerber RS-274X, Gerber X2, ODB++ or other common formats. Design files are saved as proprietary .BAC files which can be used to purchase PCBs from Bay Area Circuits. We’re so confident you’re going to love our manufacturing service, that we’ll provide you with Gerber files free of charge upon shipping of your PCB order. Q: What if I require export capability? A: If you require the capability to export your design to Gerber RS-274X, Gerber X2 or ODB++, now or anytime in the future, we offer an upgrade path here which unlocks these additional capabilities. Unlike other manufacturer-specific PCB design software which lock you in to their proprietary format with no export support or upgrade path, we support you with both and encourage you to take advantage! Q: What if I prefer to order the PCBs from someone else? A: While it’s nearly impossible for us to imagine why you would want to do that, you’re completely welcome to do so. This would require you to export design files in a common format and to do so you would need to upgrade. Q: Where can I learn more about PCB Creator? A: Give our PCB Creator announcement a read and then head on over to our website where you can find detailed information on PCB Creator here including features, tutorials, upgrades & support. Q: Where can I download PCB Creator? A: PCB Creator is always available for free from our website here. Q: How do I order a PCB I’ve designed with PCB Creator? A: PCB Creator has integrated pricing and ordering. Once you’ve designed your PCB through the circuit layout software, you can view pricing and start the ordering process within the application by navigating to File > Order PCB from Bay Area Circuits.